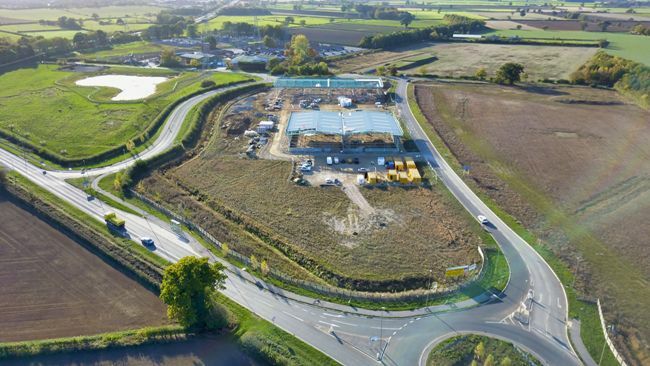 Work is now progressing well on the first phase of the 30-acre Eden Business Park near Malton. The multi-million pound business park, which is located immediately off the A64 by the Pickering Road (A169) junction by Eden Camp, will create 600 new and sustainable jobs. The first phase of this mixed industrial and office development comprises top specification warehouse accommodation in two terraces of 20,000 sq ft each, with four units of 5.000 sq ft and two units of 10,000 sq ft each. The units will be ready for occupation, on a freehold or leasehold basis, at the end of February 2019. Yorkshire-based developers CDP Marshall are confident that the business park, the largest speculative development in the area during the past 10 years, will prove popular, fulfilling a pent-up demand for quality industrial units with offices. Miles Lawrence, director of York-based property consultants Lawrence Hannah, who are marketing Eden Business Park, said: “This is a very important development for the Malton area. This initial speculative first phase is providing six high-quality industrial warehouses, in a superb location, with easy access to York, the East Coast and to Yorkshire’s excellent motorway network. “Now that work has started on site, with the steelworks up, we are beginning to get very positive inquiries from companies wanting to either rent or buy the available units. We expect this interest to intensify as the units approach and then reach completion. The business park features a vibrant, highly-landscaped, semi-rural environment with infrastructure works such as access roads and a roundabout already in place. These works have been part funded by a £2.1m grant through the Local Growth Fund. The grant was awarded by the York, North Yorkshire and East Riding Local Enterprise Partnership (LEP) after a bid was put forward by CDP and Ryedale District Council. The joint marketing agents for Eden Business Park are the Leeds-based property consultants AWS.